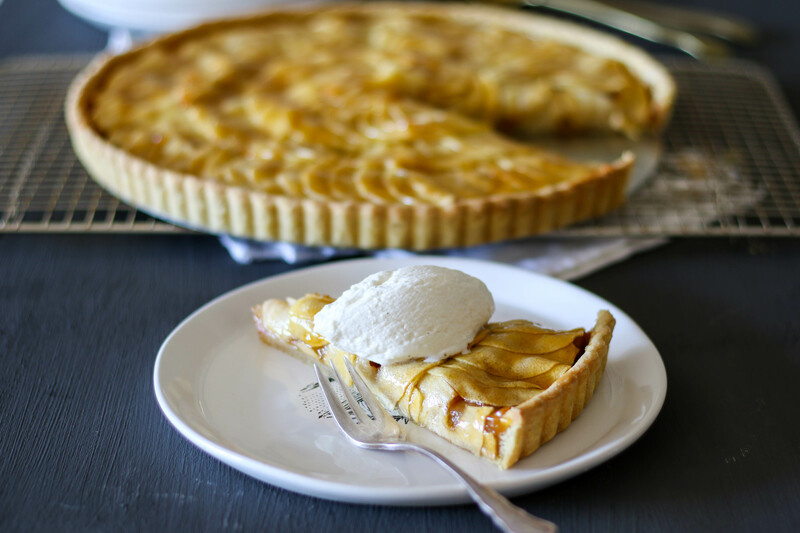 The classic French Apple Tart is a staple for your recipe book arsenal. A real crowd pleaser this one. 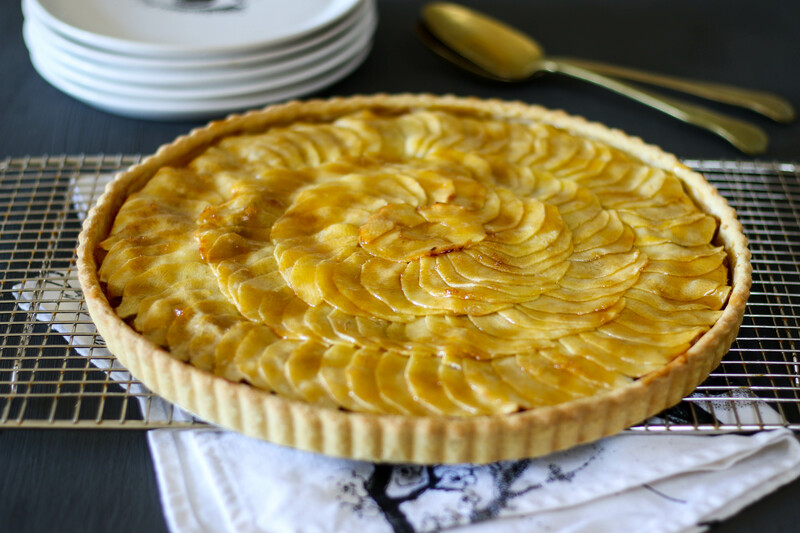 What I love about this tart is that it’s got just the right amount of swanky. Impressive enough that it looks beautiful but also easy enough to make at the last minute. I decided to start the last week off with a juice cleanse. Well that lasted one whole day and I ended up with a bunch of unused apples and a rather excessive amount of kale and celery. 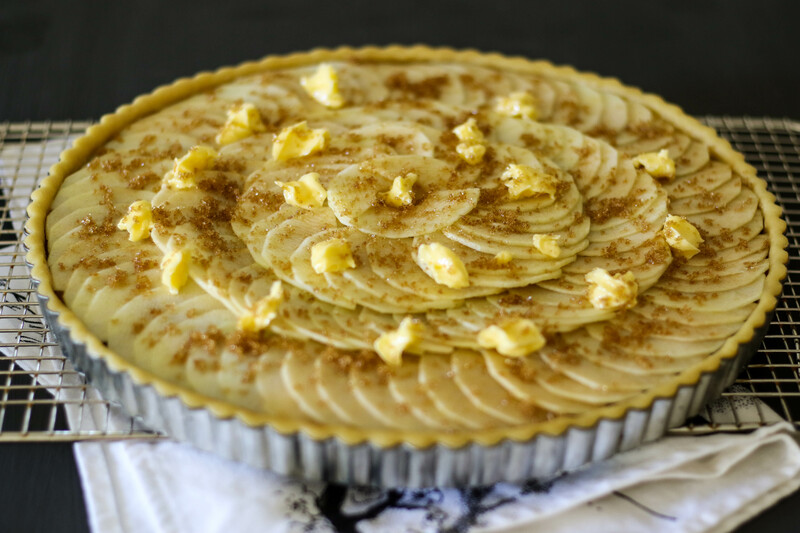 So instead of presenting you with a kale and celery tart I went with an apple tart instead! Begin your sweet pastry dough. Whisk flour, sugar and salt together. Add butter and work with your fingers into a wet sandy consistency. Add the egg and vanilla and bring together into a dough. Add the tsp of cold water if necessary. Roll dough gently into a ball, flatten slightly and place wrapped up in the fridge to rest. For the filling melt butter in a large saucepan. Add the diced apples, sugar, vanilla and cinnamon. 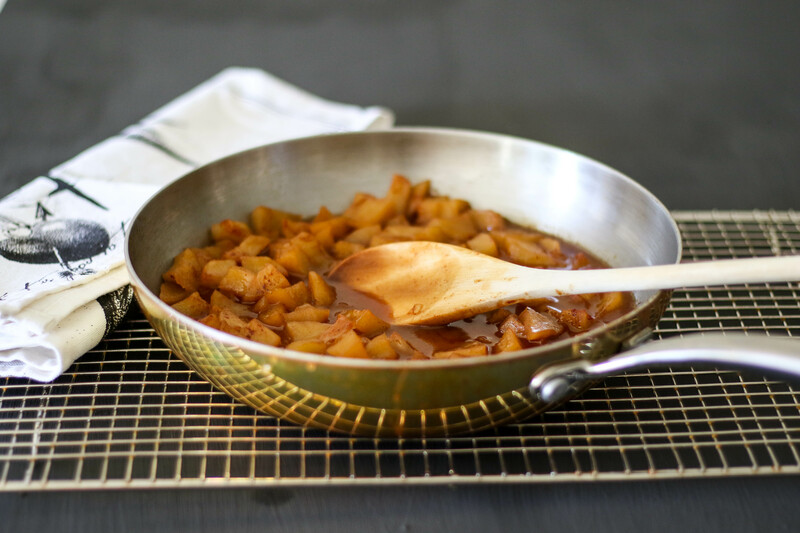 Cook down until apples are soft and fragrant. If your apples are not very juicy add 1-2 Tbsp of water to assist with the cooking. Remove apples from the pan and place in the fridge to cool. 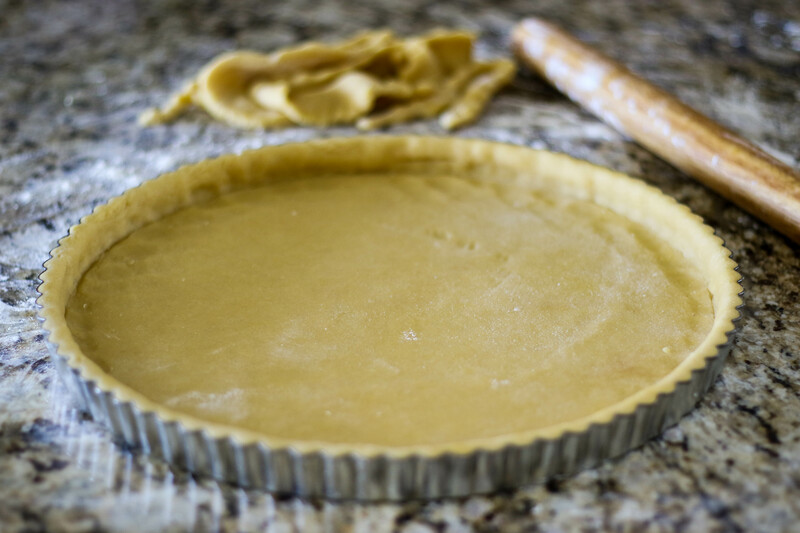 Roll out your pastry dough quite thinly and place into a greased tart shell pan. Make sure to press the pastry quite firmly into the 90˚ corners of the pan. Blind bake the crust for ten minutes using a layer of baking paper and baking beans or rice. Peel, core and slice remaining 3 apples as evenly as possible. 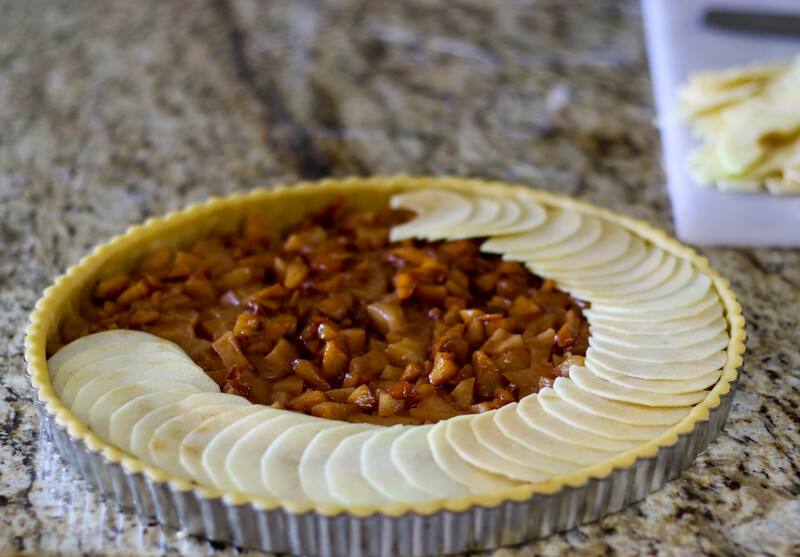 Begin assembling the tart by adding the cooked apple mixture into the bottom of the tart shell and smooth evenly. 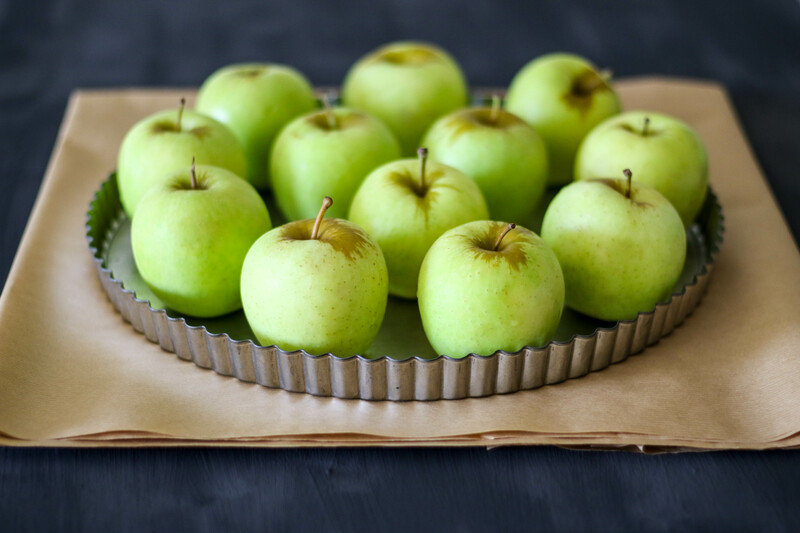 Layer apple slices one over the other in a pretty circular fashion. Dot the tart with a few knobs of butter and a sprinkle of Demerara sugar. Place in the oven to bake for approximately 20 minutes. When the tart is cooked, remove from the oven and place on a cooling rack. Mix 1 Tbsp apricot jam with a dash of water in a saucepan. 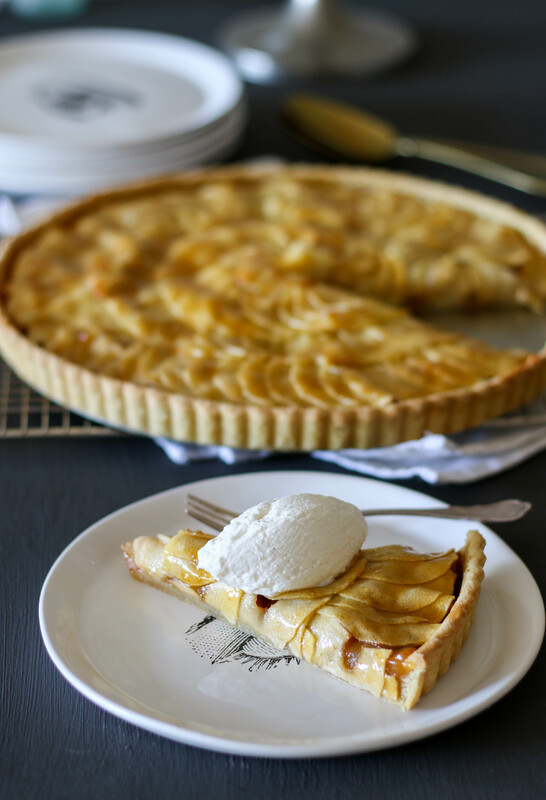 Mix into a glaze and using a pastry brush, glaze the tart for a shiny finish. Serve with whipped vanilla cream or ice cream.